PS-SEND Audio to IP Streaming Encoder. All the configuration settings for the unit are accessed via a local web-server built into it. The type of encoding and the transport mechanism are defined by selecting the connection from a pre-defined list. The PS-SEND encodes an audio source into an MP3 (from analogue or digital inputs), G.711 or PCM (from analogue inputs only) audio stream using HTTP, RTP, raw UDP or raw TCP protocols, including multicast support and the following encoder types are available: Mpeg1 & 2 Layer3, MP3 CBR (constrant bit-rate), PCM linear and A-law, U-law, with 8kHz-48kHz sample rates . The unit can configure its own IP address using DHCP/BOOTP, IPzator or AutoIP. 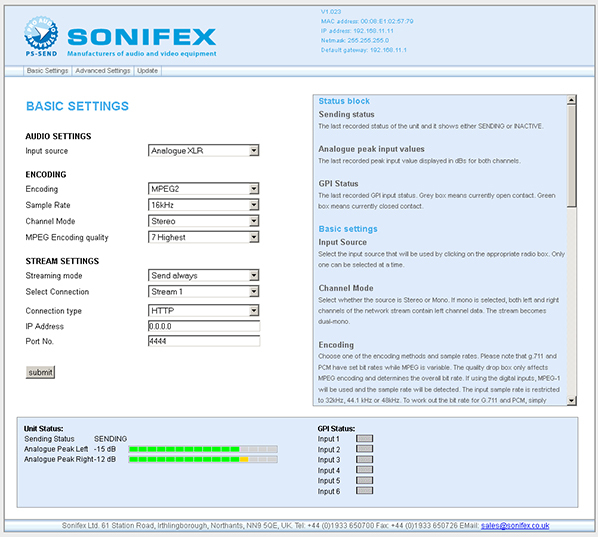 A readout of the set IP address can be heard on every reset using SONICIP technology, if selected. Remote level monitoring is also possible using SNMP traps. Two red and green front panel LEDs indicate what state the unit is currently in, be it normal operational mode or bootstrap mode, and also indicates the current network connection status. A blue LED denotes power to the unit. The input being routed to the IP stream can be monitored on the front panel ¼” (6.35mm) stereo jack socket in combination with a headphone volume knob. The rear panel has 2 x RJ45 connectors, one for the 10/100Mbit Ethernet interface and one for GPI connections. The PS-SEND has 6 x GPIs which can be used to trigger the sending of the audio stream and which can also be used to trigger remote events using an output relay on the PS-PLAY and PS-AMP. There is a 9 way D-type RS232 serial connection for control of the unit by automation systems and firmware updates. The unit can be remote controlled via serial connection, TCP or UDP. Power to the unit is via a universal supply 85V - 264V fused IEC mains socket.